1. Humans are no longer the best Chess players in the world. It’s somewhat depressing to study and play a game when you know that a program you can buy for $50 can out-play you, or any other human. 2. Chess opening theory has become extraordinarily detailed, and onerous to study. Very often, grandmaster games begin with 20 or more known theoretical moves. Moreover, nowadays most new theoretical novelties are suggested and analyzed by computer programs used by top players before their games. If a player does not keep up with opening theory, he will be at a disadvantage, but many people find the prospect of studying openings in this way increasingly dehumanizing. 3. Most games between top-flight Chess grandmasters end in a draw, simply because Chess is almost certainly a draw with best play. To take one example, Kramnik won his match against Kasparov in 2000 with 2 wins, no losses, and 14 draws. I want to propose here a Chess variant, that I developed with my son Adam, that addresses all these problems. We call this variant “Enhanced Chess.” In Enhanced Chess, there are no draws, there is no opening theory (or endgame theory) to study, there is no advantage for the first player, and humans should out-class computers for a long time to come. The game is extremely skill-intensive; the more imaginative and “cerebrally fit” competitor will definitely win the game. The game combines a couple existing Chess variants. The first of these variants is “Bughouse Chess.” Ordinary Bughouse Chess is played by two teams of two players each. On each team, one player plays White and the other plays Black. When you capture one of your opponent’s pieces, you hand it to your partner, who can drop it on his own board rather than making an ordinary move. Pawns may not be dropped on the first or eighth rank, but otherwise there are no restrictions on drops; you can even checkmate with a dropped piece. When a pawn reaches the eighth rank, it is promoted normally, but if the promoted piece is captured, it turns into a pawn again. The game ends when one of the kings is checkmated. In Enhanced Chess on the other hand, a single player will control both the boards on his side, so that the game is again a two-player game. Moreover, the moves are made in a strict turn-based order. First Player 1 makes a move with White, then Player 2 makes a Black move followed by a White move, and then the players continue to alternate, always making a Black move followed by a White move. Notice that because Player 1 only makes one move on his first turn, and then Player 2 makes two moves, there is no obvious advantage to going first or second. Time controls can be as slow as you like; Enhanced Chess is meant as a serious game. Chess with randomized initial positions (sometimes called “Fischer Random Chess” or “Chess960” because of the 960 legal starting positions) is already a somewhat popular variant. Levon Aronian is the current “world champion” of this variant, having beaten Vishy Anand (the current world chess champion in ordinary Chess) in a short match in 2007. One difficult point in Chess960 is how to handle castling. In Enhanced Chess, we propose to handle this problem by simply forbidding castling. Castling is usually of dubious utility in any Bughouse Chess variant in any case, and there’s no reason to carry all the complicated rules baggage. There would also be more than 960 legal starting positions, because while Chess960 tries to ensure that the kings start between the rooks, in Enhanced Chess that is not necessary. (We still required that the two bishops on each side start on opposite color squares). Making a pair of moves which repeats a position (on the combined boards) is forbidden in Enhanced Chess, and stalemate is a loss. These rules remove any theoretical possibility of a draw. It is interesting to speculate on what the “correct” result would be in Enhanced Chess if God played against God. There is no obvious end to the game until positions start repeating. It’s clearly just idle speculation, but how many moves do you think would need to occur in the perfect game tree before one side won? In practice, I don’t think that Enhanced Chess games would typically last any longer than ordinary Chess games, although a big difference is that players would definitely need to rely much more on intuition and much less on knowledge and calculation. One other big difference, which would definitely be a drawback for some players, is that reduced-material end-games would cease to exist. Enhanced Chess would be much like Shogi (Japanese Chess) on steroids, but maintaining all the familiar pieces (and removing the advantage of moving first). Finally, I should address why I think computer programs will play Enhanced Chess poorly, at least in comparison to ordinary Chess. The main point is that programs basically use a search algorithm, that would be hobbled by the much larger number of possible moves in each position (remember that for each turn you get one move on each board, and all the drops mean many more possibilities as well, so for each turn there might be 10,000 possibilities for the computer to consider, instead of 30 or so). Evaluating a position will also much more difficult for a computer in Enhanced Chess compared to ordinary Chess, because material and mobility are less important. I would anticipate based on these points that Enhanced Chess programs would perform significantly worse than Shogi (Japanese chess) programs (where there are drops, but only one move per turn), and even in Shogi, computer programs still fall somewhat short of the top level. In the 15th century, a series of major rules modifications were accepted into Chess (the modern Queen, Bishop, and Pawn moves, Castling, and en passant) that succeeded in reviving what had become a rather dull game. It seems to me that something similar will need to occur again before Chess can reverse its decline and regain its status as the King of Games. If you enjoy Chess, but want to spice it up a bit, you’ll probably enjoy some of the games in this post, which introduce the random element of cards into the royal game. Faidutti, a French historian and sociologist, is one of the best-known and respected game designers. His games tend to have a strongly chaotic element. His most popular game, which I highly recommend, is Citadels (“Citadelles” in French), which is best played with large numbers of players (up to seven, and the closer to that number, the better). Faidutti has an exceptional web-site, particularly notable for his Ideal Game Library, reviewing hundreds of games. Returning to the subject of cards and Chess, the other set of games I want to recommend is Karten Schach, designed by Reiner Knizia, the prolific German mathematician and game designer whom I already discussed in this post. Karten Schach was a labor of love by Knizia (I can’t imagine he thought it would sell very well, and the rulebook is over 100 pages, mostly taken up by discussions of the game mechanics, with plentiful strategy tips). Without explaining the rules in detail, I’ll just briefly describe how a couple are played. In Oracle Chess, you must, at the end of each move, put a card face down which commits you to the piece you will move next turn. In Capitalist Chess, on each turn a card is chosen, and you bid chips to have the right to move the piece displayed on the card. Each game is defined by less than a page of brilliant rules, by the master of boardgame design. And just as I did for Faidutti, I’d also like to recommend one much more mainstream multi-player Knizia game (in case Chess variants are not your cup of tea). The Knizia game I’ll recommend is “Modern Art,”, one of the most highly rated of the German games; a classic in the auction game genre. Note: to understand this post, you don’t need to know anything about chess; I’ll explain everything necessary right here. One of the best ways for a chess beginner to improve is to study king and pawn endgames, and one of the best ways to do that is to play a game with only kings and pawns. Just remove all the rest of the pieces, and have at it. Unfortunately, while Chess with just kings and pawns is not trivial, as you improve you will eventually outgrow it, because between two good chess players, the game is very likely to end in a draw. As I mentioned in an earlier post, my son Adam likes to design games, and he designed this very clever variant of the King and Pawn endgame that eliminates the possibility of a draw. Set up the pieces as above, with four pawns plus a King for both White and Black. The players alternate moves, starting with White. The pawns move as in chess: one square forward, or optionally two squares forward if they haven’t moved yet, and they capture a piece one square ahead of them diagonally. Pawns may still capture en passant as in Chess, which means the following. If an enemy pawn moves two squares forward, and one of your pawns could have captured it if it had only moved one square forward, you may capture that pawn as if it had only moved one square forward, but only if you do so with your pawn on the turn immediately after the enemy pawn moves. You win the game immediately if you capture the opponent’s King, or if one of your pawns reaches the other side of the board. That’s all the rules. In this game, draws are impossible, even if only two Kings remain on the board. 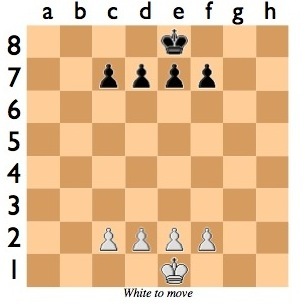 For example, imagine that the White King is on a1, and the Black King is on b2. If White is to move, he loses, because he must move to a2 or b1, when Black can capture his King. But if Black is to move, he must retreat to the north-east, when White will follow him, until Black eventually reaches h8 and has no more retreat. So arranging that your opponent is to move if the two Kings are placed on squares of the same color (if there are no pawn moves) is the key to victory. This concept, known as the “opposition,” is also very important in ordinary Chess King and pawn endgames, which is why skill at chess will translate into skill in this variant, and why improving your play at this variant will improve your Chess. Of course, the pawns are there, and they complicate things enormously! Naturally, one can consider other starting positions, with different numbers of pawns. This game can be analyzed using the methods of Combinatorial Game Theory (CGT). Noam Elkies, the Harvard mathematician, has written a superb article on the application of CGT to ordinary chess endgames, but it required great cleverness for him to find positions for which CGT could be applied; with this variant, the application of CGT should be much easier. If you like abstract games, especially chess variants, you should enjoy Zillions of Games. It’s quite an amazing piece of software; a piece of AI technology that I actually would have not thought possible. Games are defined using a rules file (written in a Lisp-like language), and then a generalized alpha-beta search engine is unleashed. Basically, it works best for Chess and its many variants, but it plays a really surprising number of games very well. It comes with over 350 games and puzzles, and you can download thousands more. It’s not that hard to modify existing rules files to define new games; my son was interested in having an opponent for a game he invented and we were able to modify an existing rules file to play his game in less than an hour–and it played very well. Naturally, it doesn’t play all games as well as humans, but it plays so many games so well (with adjustable levels to make a fair fight if it’s too good) that one can’t complain. Unfortunately, it’s only available for Windows computers.